No doubt about it, the term “awesome” is overused. I’m guilty myself. According to Webster’s Dictionary, the word has been around since 1598. Its definition? Extremely impressive or daunting; inspiring wonder, particularly as related to the sacred or sublime. We ought to save this special adjective for special things, not to describe a juicy cheeseburger or a beautiful wedding gown or even an outfielder’s over-the-fence leap and catch that ends a ballgame in the bottom of the ninth inning. “Awesome” should be saved for when we talk about the Grand Canyon. Bravery in battle. The birth of a baby. And, yeah. A total solar eclipse. On August 21, as I settled onto a gigantic flat rock that thrust out over a pristine valley deep in the wilderness of White County, I thought I knew what to expect. Around noon, the sun would begin moving behind the moon. An hour and a half later, those of us lucky enough to be smack dab in the middle of the line of totality would witness a total solar eclipse. I’d seen pictures of what was going to happen. I’d read and listened to descriptions of what to expect when the moon completely covered the sun. The sky would grow dark and the air temperature would drop. We’d see Bailey’s Beads, the diamond ring, and the sun’s corona. Stars and planets would be visible. This amazing experience would last for about two-and-a-half minutes before the sun would peep out again. By three o’clock, everything would be back to normal. Unless the world came to an end. Those of us gathered on the rock that day talked about how terrifying an eclipse must have been for people who lived in less enlightened times. Might we be able to channel what our ancestors thought and felt? Would we think a dragon was eating the sun? Would we have an urge to throw spears at the sky? Would we break into wild song and dance? Or would we be so hard to impress that we’d find the experience much ado about nothing? None of those things happened. While we waited for the show to start, we laughed and talked and nibbled on our snacks. We complained, just a little, about the heat and humidity. We fiddled with our eclipse glasses. 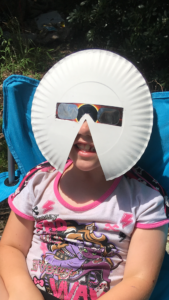 We admired six-year-old Olivia’s eclipse mask, a paper plate with eye holes for her glasses and a triangular cut-out for her nose. When the moon began to cover the sun in earnest, everyone grew quiet, just like the birds. All of us murmured “wow.” I got goosebumps all over and felt an unexpected urge to cry. And then, with a 360-degree sunset all around us, official photographer Chuck Sutherland lifted his face and arms to the sky. THIS IS THE COOLEST THING I’VE EVER SEEN, he hollered. It was a moment both sacred and sublime. Exactly what the word “awesome” was invented for.